Is there a fire hydrant in front of your home or your neighbor's home? In the event of a fire emergency, could firefighters find the hydrant near your home? We are encouraging residents to "adopt a fire hydrant" near their home and keep snow shoveled away and vegetation trimmed back. This will ensure hydrants are visible and will greatly speed the response time in case of an emergency. Time spent by firefighters searching for and clearing hydrants buried in drifts or plowed snow is precious time lost to fight a spreading fire. 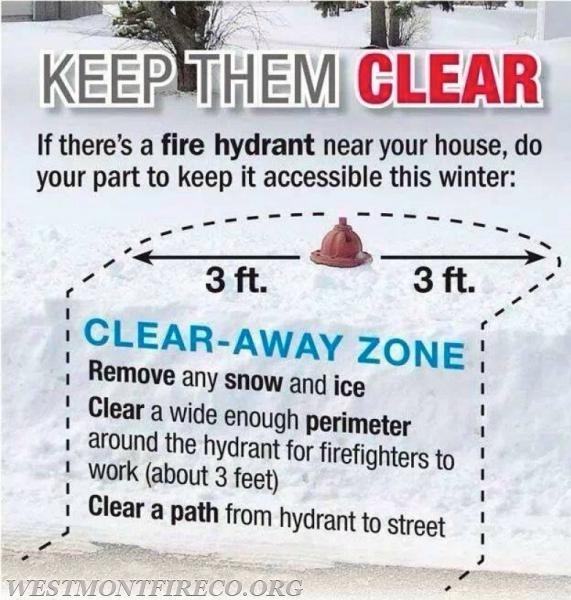 At minimum, fire hydrants need to have enough snow cleared away to be visible from the street. The best option is to clear a 2-3 foot circle around the fire hydrant, so firefighters have complete access in an emergency.